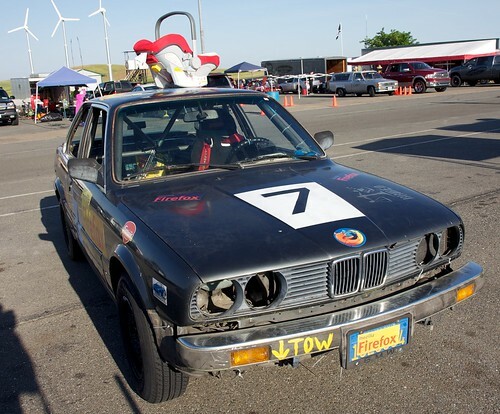 24 Hours of Lemons: Success! 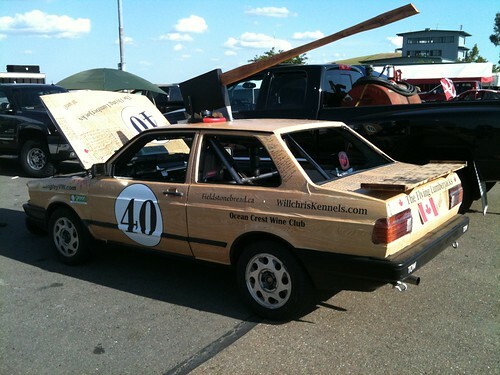 After many months of hard work team BVD Skidmark completed its first 24 Hours of Lemons race! It was two awesome days of driving with few mechanical problems and lots of fun. I have to say I’ve never felt so proud of something (especially my team, everyone put a lot of effort and made it a great experience for all of us). Our car was a 1986 BMW 325es (the ‘e’ stands for economy, meaning we had a much lower horsepower engine than a normal 325) nicknamed Cheesy Gordita Crunch. 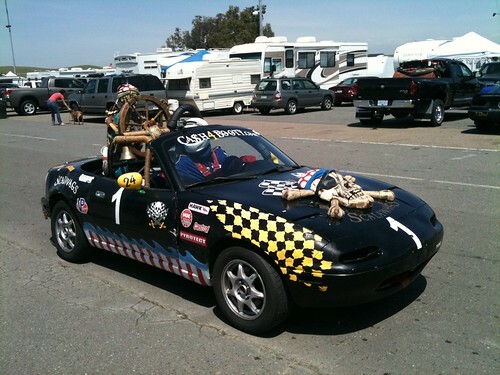 Even though it had been completely underwater at some point before we purchased it (mold growing on the engine block and all the carpets and insulation were completely waterlogged), it proved itself worthy, completing the entire race with minimal technical issues. Yep, those are cooking thermometers. Other ends were zip tied to the radiator. When they beeped it meant we were overheating, or, the roast was done. 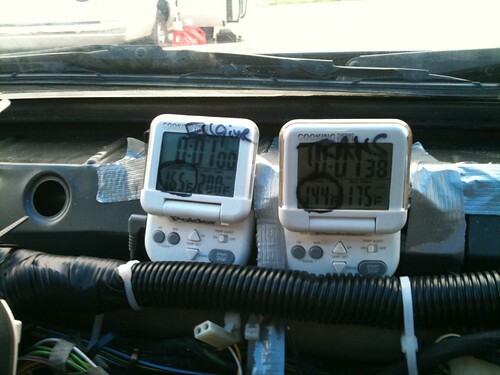 Honestly I think Lemons racing is much closer to real racing than taking your fancy car to a track day for a few hours. We became 100% knowledgeable about every piece of the car. We stripped out the entire interior (actually a lot of work), replaced brakes and rotors, tires, brake cylinder, removed the A/C unit, removed windows, removed the entire dashboard, replaced the gas line, installed the racing seat and harness, re-routed wires, installed a kill switch (which involves cutting a 1-inch thick wire, not an easy task), re-routed coolant tubes and so many other crazy hacks. You form an emotional attachment to your car after you spend so many weekends working on it. Anyway, it was an awesome experience and I’m already psyched for our next race in August! See you on the track!